Connect with the local beverage industry. Trade news, trends and insights. After a decade at the top of the premium gin market in the U.K., Caorunn Gin has introduced an updated bottle for the U.S. market, marrying the spirit’s artisan roots with sleek aesthetics. The bottle’s signature pentagonal form is representative of the five natural Scottish botanicals that surround the Speyside distillery and are hand-harvested by Caorunn’s Gin Master, Simon Buley. The decanter is now more streamlined, ensuring an easier fit behind the bar and on shelf. 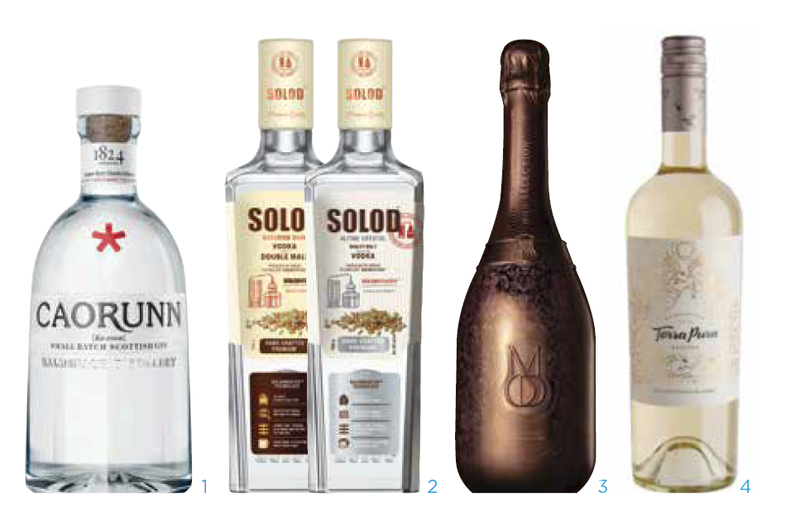 New from Ukraine, in two expressions, Solod is handcrafted vodka based on malted barley. Its 25-day production cycle starts with a unique water-softening method. Borrowing technique from Irish whisky-making, this malt vodka is twice triple-distilled; then it is filtered through carbon, platinum, silver and birch charcoal. Solod Alpine Crystal is classically pure, soft and light. Solod Bavarian Dark has a light rye bread aroma and honey notes. Both are 80 proof. Produced in the Vallée de la Marne for over five generations, Mod Sélection Champagne is the latest effort from musical artist Drake and Brent Hocking (founder of DeLéon Tequila). Mod Sélection distinguishes itself in being Pinot Meunier-dominant, and is produced using natural clarification and rigorous fermentation controls. Its Mod Rosé is one of few Champagnes produced via the saignée method. The avant-garde bottle décor represents a modern interpretation of the tradition and elegance that is Champagne. Having bought and upgraded the TerraPura winery in 2016, Matetic Wine Group, known as a champion of organic and biodynamic farming in Chile, has now given the TerraPura line a makeover, showcasing the best of Chile’s top wine valleys. The six TerraPura varietal wines, all 2018 vintage and carrying a Reserva designation, include: Sauvignon Blanc, Chardonnay and Merlot from Curico Valley; Pinot Noir from Itata Valley; and Carmenere and Cabernet Sauvignon from Colchagua Valley. Sterling Vineyards is bringing a trio of their Vintners Collection wines to market in resealable aluminum bottles. 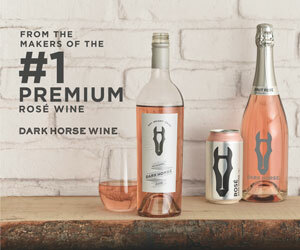 The recyclable bottles feature a brushed texture in a tall, narrow 375ml size accented by a color cap and base keyed to wine type: Chardonnay, Cabernet Sauvignon or Rosé. POS support includes a dispenser display, shelf talkers, case cards and a plastic tote that can carry four cans with ice. New from Terlato, spun-off after a red-hot start within The Federalist brand, Dueling Pistols takes luxury California red blends up a notch—dramatically. 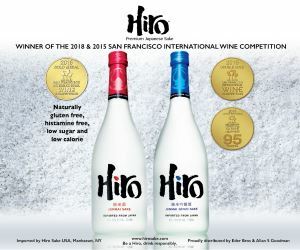 The duo of 50/50 blends from highly regarded regions—Zinfandel-Syrah from Dry Creek Valley and Cabernet Sauvignon-Petite Sirah from Paso Robles—present bold, structured flavor profiles based on varietal tension, just as eye-catching graphics capture the tension of a duel. Dueling Pistols offers modern winemaking with a catchy story and vintage feel. 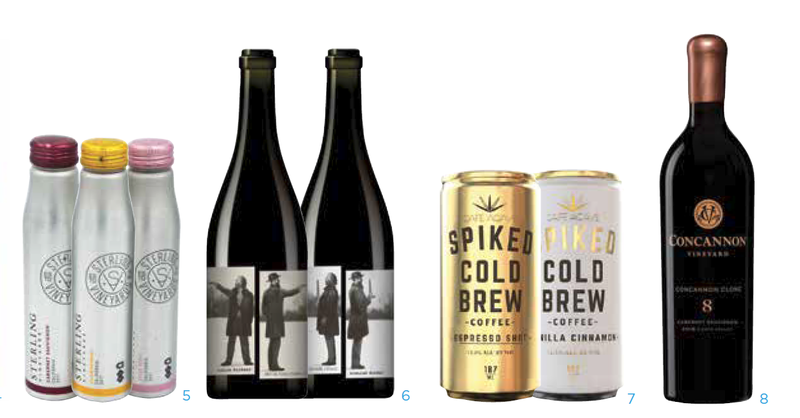 Coffee has already found ways to play with rum, whiskey and liqueurs; with its agave link, Café Agave pushes java in a new direction spiritwise. This ready-to-drink coffee and alcohol beverage is made with 100% Arabica Colombian cold brew coffee, real dairy cream, all-natural fermented agave and agave nectar. Available in four flavors: Espresso Shot, Caffe Mocha, Salted Caramel and Vanilla Cinnamon. 12.5% ABV; single-serve 6.3oz (187ml) cans. Limited distribution. Concannon Vineyard clones are estimated to account for 80% of the Cabernet Sauvignon vines now growing in California. The winery’s Clone Series honors that historic connection by sourcing Concannon Cabernet Clones from various premier California appellations. The latest (second) release is the 2016 Concannon Clone 8 Cabernet Sauvignon from Napa Valley; it joins the inaugural release, a 2014 Concannon Clone 7 from Sonoma’s Chalk Hill. 101 cases made. The first in a planned line of “ready-to-pour” bottled cocktails, Empower Cosmopolitan Martini is the based on sweet potato vodka from a family-owned farm in Northern California, triple sec, cooling white cranberry and zesty lime. Empower Cocktails was conceived by Tiffany Hall, a New York City-based entrepreneur aiming to empower women to be bold, confident and celebrate life. The Cosmopolitan Martini is 25 proof and contains 80 calories per 3 ounces. Serve chilled. Booker’s has released a 30th Anniversary Bourbon celebrating the legacy of late Beam Master Distiller Booker Noe and the founding of his namesake brand three decades ago. Booker’s 30th Anniversary Bourbon features a mingling of uncut, unfiltered 9-year-old and 16-year-old Kentucky Straight Bourbon whiskies, which together present robust flavor with signature notes of vanilla. Bottled at 125.8 proof, under the watchful eye of 7th Generation Master Distiller and Booker’s son, Fred Noe. 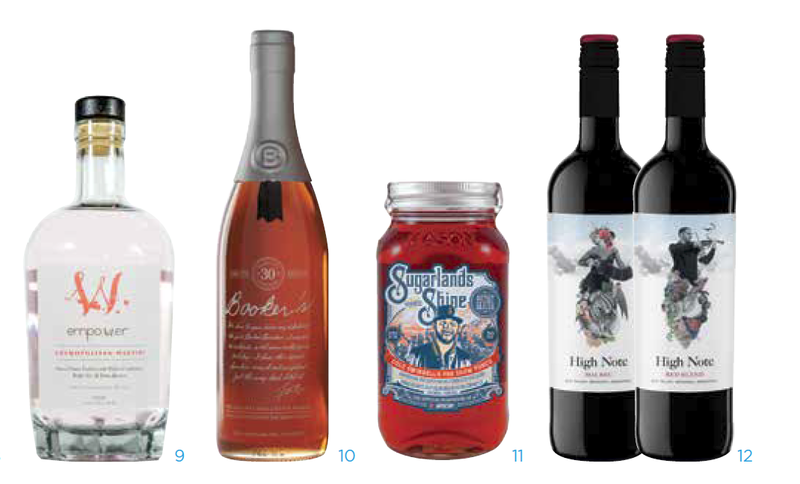 The latest moonshine from Sugarlands Shine comes with a twist as the distiller teamed up with chart-topping country music singer and songwriter Cole Swindell to create his ‘Pre Show Punch.’ It combines tropical flavors with hints of cherry; bottled in the line’s classic mason jar. 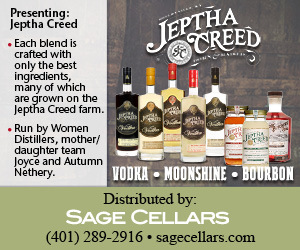 It’s actually their second collaboration, having already made a 100-proof Peppermint Moonshine. 50 proof. High Note, owned in partnership by Winebow and Catena Zapata’s Laura Catena, has undergone a re-design, with realist-style label art aiming to convey the revolutionary spirit of Argentina. The Malbec 2017 features a woman playing the bandoneon while the Red Blend 2017 ($12) shows a man playing violin; there is also a ceibo (Argentina’s national flower) in the her hair, and an Andean condor soaring over the man’s head. Both are scheduled to reach market in March. Share local and national industry news with our online community. April Cover Story: Cannabis … Friend or Foe to Alcohol?